We work around the clock to make sure that you always get the highest speed you can possibly get from your connection. Our 1 Gbps servers from USA, UK, Netherlands, Germany, Canada, France, Italy, Poland, Australia and Singapore are configured and maintained by the best specialists. So, if you are looking for a safe and fast connection, with us, you already got it. Providing a high security level of encryption is our top priority. As long as you are connected to our VPN servers, we guarantee that your traffic is 100% protected from any prying eyes. To accomplish this, we use the strongest encryption which makes impossible to decrypt any data that comes or goes from your device. We know that for many people remaining anonymous while surfing the web is very important. For that reason we decided to maintain “zero logs protocol” from the beginning. With us it’s safe to say that you don’t have to stay offline just to be a stranger to the Internet. With us you can check and double check that your traffic is private and secure. Our DNS Leak protection feature will allow you to use our DNS addresses to make sure that your DNS requests are going through us instead of directly to your ISP. Our users enjoy a No Speed or Bandwidth Limit policy from our services. Even more, we will make sure that you’ll constantly get the best out of your internet connection. Our service is fully adjustable and ready to deliver high performances regardless of the device and iOS you are using: Windows, Mac, iOS, Android, Apple TV, XBOX ONE, XBOX 360, PS3, PS4, FireTV, Roku, Samsung Smart TV and more. All our VPN servers are configured to offer proxy services too - free of charge, of course. If you’d like to use them only as proxy servers, you can do so whenever you want! Setting them up is easy, and we offer tons of helpful tutorials as well. One of the best way to bypass restriction is Smart DNS. For your benefit we will make the best out of your connection. With Smart DNS you can enjoy your original speed while you are safely streaming video and audio, or any other kind of browsing. Get limitless access to websites from US, UK, Canada, Germany, France, Sweden and Poland at the same time, without changing any settings in your device. That’s right! You can connect as many devices as you like at the same time. The only condition is to have them all connected to the same network. We know you use at least a couple of different devices to watch media: your desktop, smart TV, your phone and tablet to name just a few. With SmartyDNS you can connect all of them at the same time. The only condition is to have all devices connected to the same network. 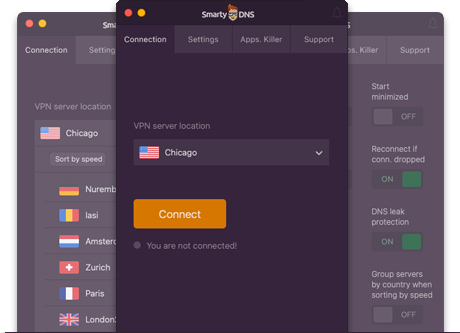 Using our Smart DNS service, you are able to unblock geo-restricted websites and apps that are blocked outside the US, UK, Germany, France, Sweden, Canada, Poland and Switzerland. Access unblocked websites with your provider's original speed. We are sure that you will be as happy and pleased as we are confident about our software’s great performances. But, don’t worry, you don’t have to take our word for it. You can test SmartyDNS service for free before you buy it! You can definitely rely on the high quality of our service. However if, for some reason, you consider it does not perform as good as we say it does, you will get a full refund of your money within the first 30 days of subscription. For every question you might have, we are here for you. Our specialists will help you with complete and easy to apply solutions. Just start a live chat or submit a support ticket from the client area.